The defining characteristic of emerging market equities is the inherent cyclicality of the asset class. The lack of volatility and high returns evidenced in 2017 reversed in 2018. We believe the market is overly cautious with regards to the possibility of a Chinese hard landing. Unwinding of quantitative easing (QE) policies presents a challenge in the short term, but offers opportunities for stock pickers such as ourselves. We believe the defining characteristic of emerging market equities is the inherent cyclicality of the asset class. Measured as one of 10 asset classes, over 20 years, emerging market equities have been either the best-performing or the worst-performing asset class in 15 of those 20 years. After 2017 – a year full of returns with virtually no volatility – 2018 has turned out to be the opposite: packed with volatility, and bereft of return. This makes us inherently cautious of making bold forecasts of the future. Anatoliy Chepiga and Alexander Mishkin, the Russian spy poisoning suspects. Economically and financially, the end of quantitative easing (QE) has finally arrived. As the tide of liquidity slowly ebbs away, we are finding out “who’s swimming naked”, to quote Warren Buffet. Argentina and Turkey were clear culprits in this regard. Changes in perceptions are more difficult to call, but there are grounds for concern. For ten years markets have floated on the calm sea of QE, with central bankers prepared to assist at the first sign of a twitch in the markets. Investors have unsurprisingly become complacent about risk in this environment, not least that market participants are crowded together in a slew of trades that generally offer less compelling valuations to historical averages. The unwinding of QE will be a difficult and painful experience, and there will be casualties. Market levels are determined by two variables: economic reality and the market’s perception of that reality. The reality is that two large economies now drive our world: the US and China. The markets clearly are pricing in an economic slowdown in the US. They are fearful that a trade war and aggressive deleveraging may trigger a hard landing in China. We are convinced that over time economic growth in China will slow, for growth to remain towards 7% per year would imply its economy doubling in size every ten years – likely impossible given the iron law of large numbers. However, we see no evidence of any imminent rapid decline in the Chinese economy. Going forward, we believe China is likely to become a heightened focus of investor attention. The market has been extremely schizophrenic about China in 2018 and commentators have ceaselessly worried about a dramatic slowdown in the Chinese economy. What investors have actually done, however, is subscribe to more than US$50 billion of IPOs from Chinese companies (as at end September 2018), 65% up year-on-year. This tally represents a third of all global IPO proceeds, putting China on track for the third-highest capital raising on record. China’s IPO proceeds have now been greater than those in the US for five consecutive years. Furthermore, most of the money raised has been in ‘new economy’ companies – electric cars, Internet Protocol Television or IPTV, smartphones, e-commerce related, etc. China and the US now dominate the technology trends driving our world. In addition, the opening of China’s domestic equity market (‘A-shares’) opens up a very large, inefficient and uncorrelated investment opportunity which most global investors are only just waking up to. This emerging opportunity will drive significant investment flows over time. Forecasts are inherently limited and are not a reliable indicator of future results. Source: IMF History & Forecasts, at current prices, as at August 2018. Value is now scarce in today’s financial markets. Since 2007, despite the Global Financial Crisis, the world has added almost 50% (US$78 trillion) to the global debt tally. Much of that debt supports today’s asset markets, either directly (leveraged property investments) or indirectly (US share buy-backs supported by borrowing). We would argue that one of the few pockets of relative value left is emerging market equities. The current 30% discount on emerging market equities (on both trailing price/earnings ratio [PE] and price/book) compared to developed market equities offers good value in a relative sense. In an absolute sense the c. 13.4x trailing PE as at end of the third quarter 2018 has historically been a good entry point in valuation terms, generating double-digit returns on average over a three-year period (although c. 20% of the time you could also have seen negative returns even from that low entry point). Emerging markets have traded at higher valuations than this roughly 70% of the time in the past 25 years. We fervently wish for today’s central bankers to return to anonymity, so that real fundamental investors can once again determine where value lies in capital markets. 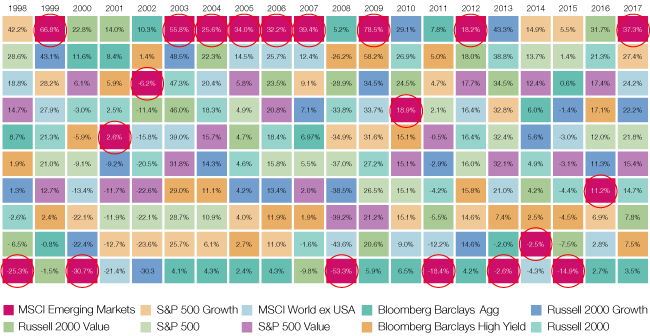 This will likely lead to much more dispersion of stock returns, in a much more volatile environment. We believe such an environment will increase the opportunities for stock pickers such as ourselves, albeit within a riskier environment. But higher risk should mean higher return, assuming we execute our investment disciplines faithfully and professionally. We might argue in short, when the going gets tough, the tough get going. Emerging market corporate debt has generally held up better than sovereign debt, partly reflecting better credit quality and lower duration. 2018 has proven to be a year of low default rates, which should continue into 2019. China’s economic policy will be a significant driver of returns in 2019. We think emerging market credits will outperform similar developed market credits, given the higher yields and stronger credit metrics. In a world of stronger growth, we expect significant spread compression, particularly in high yield bonds, while slower growth should see investment grade bonds outperform. We believe the asset class remains diverse enough to navigate either scenario and deliver excess returns above the yield. Clearly, emerging markets have had a challenging year in 2018. Headwinds from tightening global financial conditions have played out against a backdrop of US trade tariffs and idiosyncratic risks in emerging markets. However, while global growth improved, the growth difference between emerging markets and the US shrank. Taken together, these factors have served to weigh on emerging market debt. Emerging market corporate debt has generally held up better than sovereign debt, partly reflecting its better credit quality and lower duration. In addition, arguably the greater resilience of the asset class also helped. It is more exposed to emerging market countries with a higher contribution to global growth and less exposed to more vulnerable frontier markets. Looking ahead, we expect some of the headwinds – trade tariffs, overlaid with a late-stage developed market cycle, tightening US dollar liquidity and moderating US growth – to continue. Ultimately, we expect emerging market fundamentals to prove resilient. Valuations point to a significant deterioration in overall credit quality, more consistent with a global recession than a softening of growth. While emerging market growth may have disappointed expectations, 2018 has generally delivered solid corporate growth. Although currencies have weakened against the US dollar, companies have been able to pass on most of the rise in input costs to customers, balancing price increases with protecting volumes. As such, margins remain healthy, especially for exporters and those companies with US-dollar linked revenues. Overall, earnings remain robust. Despite this, most emerging market corporates have operated with one eye on the rear-view mirror, mindful of the downturn in 2013-2015, while navigating changing political landscapes, deteriorating global trade relations and, in some cases, currency crises. This has resulted in relatively muted expansion plans, with generally light capital expenditure and continued financial prudence leading to asset sales, debt reduction and equity raising to maintain healthy debt levels. This general conservativeness has reinforced the resilience of those companies operating in more fragile economies, such as Argentina or Turkey. 2018 has proven to be a year of low default rates and we expect this trend to continue into 2019. Credit rating agencies are increasingly acknowledging the resilience of emerging market companies. We see increasing divergence between government and corporate ratings, as companies manage their debt conservatively while diversifying their earnings and geographic locations. Source: BoA Merrill Lynch, 30.09.18. For 2019, we expect emerging market growth on balance to remain stable, with some downside risks of a softening in demand. However, given the now relative cheapness of emerging market currency real effective exchange rates (REER), we see an attractive landscape for a large portion of emerging market corporates to continue to benefit. Baseline economic growth expectations remain supportive of continued revenue growth, with margins likely to stabilise. However, we believe it will be a year of differentiation, as emerging market currency devaluations tighten domestic credit conditions, and the impact of trade tariffs filters through. It’s also becoming less clear how long US growth will continue, leading to uncertainty over the extent of central bank rate rises. The speed of quantitative tightening adds an extra variable at a time of plentiful US Treasury issuance. These risks, alongside potential policy mistakes, suggest that caution is warranted. This base case should support credit markets by keeping US Treasury yields contained, allowing for a weaker US dollar, while providing ample global economic growth and less restrictive financial conditions to support both emerging market and US credit spreads. China’s economic policy will also be a significant driver of returns in 2019. We expect recent stimulus to have a widespread economic effect, helping to mitigate the impact of trade tariffs and stabilise growth. However, tentative signs of a property price correction suggest the risk of a broader slowdown, given the government’s focus on rebalancing the economy away from housing related investment. Thus, we remain vigilant observers of Chinese property prices and consumer sentiment. We believe the inclusion of China into the Bloomberg Barclays aggregate indices will have a positive impact on investment and growth in 2019, but obstacles remain. Overall, we expect Chinese growth to steady, but acknowledge the potential for a slowdown in growth to permeate across wider markets, with frontier markets the most vulnerable. 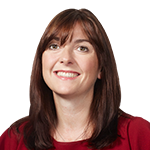 The expected general easing of growth should support fixed income assets over equities. Our base case is for a gentle moderation, rather than a broad policy-induced contraction, which suggests emerging market assets will perform well. While risks exist, emerging market corporate fundamentals remain impressively robust, with expected low defaults to continue through 2019. However, valuations have priced in significant stress for many corporates. With the outlook for global growth still uncertain, we expect volatility to remain. In a world of stronger growth, we expect significant spread compression, particularly in high yield bonds, while we acknowledge that slower growth should see investment grade bonds outperform. However, the reality is that across countries and ratings, differentiation of credits exists. The asset class remains diverse enough to navigate either scenario and deliver excess returns above the yield. Much of the asset class has excessive risk premia which should subside once visibility improves, potentially leading to strong returns from the asset class in 2019. 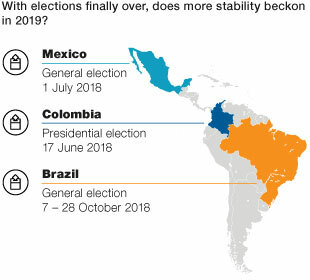 Latin America’s election calendar slows down in 2019 after a frenzied 2018. Company balance sheets are in much better shape. High yield defaults should remain low. Latin American corporate valuations have improved. We expect another year of limited net supply. 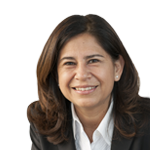 2019 is a key year for the policy agendas in Argentina, Brazil and Mexico. Latin American corporate debt continues to face a complicated external backdrop, including tighter global financial conditions and rising trade tensions. But we believe that the asset class is up to the challenge to deliver a better year in 2019, amid stronger company fundamentals, better valuations and a more positive supply backdrop. On the political front, Latin America’s frenzied election calendar slows significantly in 2019, after most of the region’s population (including Chile, Colombia, Mexico and Brazil) went to the ballot box during the past year. However, politics will remain in focus, with presidential elections in Argentina in October 2019. The policy agendas of the new administrations in Mexico and Brazil will also be pivotal for these countries’ long-term outlooks. But the noise and uncertainty derived from tracking daily opinion polls and campaign developments should be more concentrated after extreme 2018 levels across the region. Economic growth should become more positive for the region, as we foresee a gradual firming of activity after second-quarter 2018 setbacks in Brazil and Argentina. 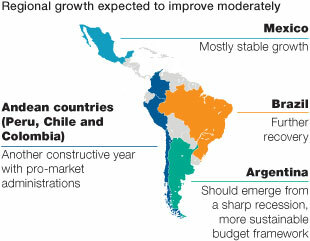 Regional growth is expected to improve moderately, with another constructive year from Andean countries with pro-market administrations (Peru, Chile and Colombia), further recovery in Brazil, a mostly stable year for Mexico’s GDP growth rate and Argentina expected to emerge from a sharp recession with a more sustainable budget framework in place. Forecasts are inherently limited and are not a reliable indicator of future results. Real (inflation-adjusted) GDP growth forecasts. Source: JP Morgan, 30.09.18. Note: For some emerging economies, seasonally adjusted GDP data are estimated by J.P. Morgan. *Applying seasonal adjustment to time periods less than a full calendar year helps to remove seasonal effects. This allows valid comparisons between consecutive time periods. Most Latin American companies have continued to deliver better results in defiance of the challenging global backdrop in 2018. On average, company balance sheets are in much better shape than two years ago. Many company executives say deleveraging efforts will continue over the coming quarters, which should help offset some of the economic headwinds. Source: Bank of America Merrill Lynch Estimates, 2Q 2018.
Credit selection remains key in this environment as quantitative easing no longer ‘lifts all boats’. But high yield defaults should remain low. We expect a mid-2% high yield default rate in 2018. For the moment, we expect that the rate will also remain relatively subdued next year (if slightly higher) given the absence of worrisome refinancing risks among lower-rated Latin American corporates (aside from a few distressed credits in construction, drill ships and highly levered telecoms, where we do not have exposure). Ongoing efforts by companies to cut costs, sell assets, rationalise capital expenditure and conduct liability management will also help. Looking at market technicals, we expect another year of more limited net supply. In 2018, combined cashflows from coupons, amortisations, tenders, calls and buybacks have exceeded gross new issuance from Latin American corporates for a fourth consecutive year – thanks in part to the lowest January-September gross issuance level since 2009. Meanwhile, the sharp drop in issuance from Argentina should further tighten supply dynamics, where the sovereign and provinces were huge issuers up until facing a liquidity crunch in early 2018. 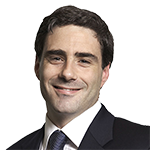 Valuations have improved significantly over the past nine months, with the average yield to maturity for Latin American corporates near its highest levels since December 2016 (and higher than the seven-year average). 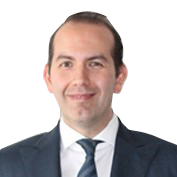 The Latin American high yield market, in particular, is providing opportunities as yields have traded near a one-year high and spread per unit of leverage moves to more attractive levels compared to US high yield on a ratings-adjusted basis. Source: JP Morgan CEMBI Broad Latin corporate bond spread, as at 05.10.18. Against this backdrop, we are still finding the most value in Brazil and Argentina. Both countries stand out as yields screen quite high on a leverage-adjusted basis compared to the rest of the region, suggesting that the higher event risk is at least partly priced in. We see more stable opportunities in Chile, Colombia and Peru, and select opportunities in Central America (focused on Guatemala). In Mexico, the portfolio is positioned a bit more cautiously pending better clarity on policies from incoming President Andrés Manuel López Obrador (AMLO). Meanwhile, we still have no exposure in Venezuela. We continue to focus on high yield while avoiding too much exposure at the lowest end of the credit spectrum. We still like select positions in quasi-sovereign oil and gas, cement, large bank sub-debt, utilities, pulp and paper, and protein producers. Our positioning is still relatively cautious on the duration front. That said, we have been adding positions at the long part of the curve during the rates sell-offs this past year. From a global perspective, interest rate volatility, growth disappointments in Europe or China, an escalation of trade tensions or other geopolitical stresses all stand out as potential risks for market liquidity and risk appetite. 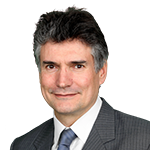 In Argentina, we believe that Mauricio Macri’s government should comply with the IMF’s tough fiscal commitments, with help from a better harvest, a cheaper currency and divisions within the Peronist party. But Macri will have his hands full on the political front as the population endures at least a couple of quarters of painful stagflation and policy adjustment ahead of October elections. In Brazil, the election of right-wing Jair Bolsonaro over the Worker Party’s Fernando Haddad improves the chances of a business-friendly agenda and continued reform. However, failure of the new administration to get social security reform and other fiscal adjustments through a fractious congress would likely stall Brazil’s economic recovery. In Mexico, the market will be alert to any divergence of AMLO’s administration from the country’s usual conservative macroeconomic stance, particularly following his October decision to cancel Mexico City’s new airport after a public consultation.